Whitechapel on the monopoly board is brown. Value £60. Whitechapel has so many places of interest it was difficult to decide what to show you. That was until I discovered the bell foundry. What an interesting place. Casting bronze bells since 1570. 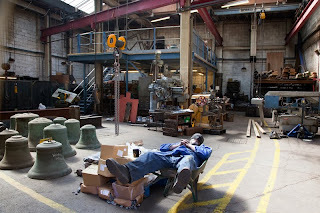 The bells from this foundry are all over the world. Big Ben in London, Liberty bell in America, New Zealand, and Iceland all have bells from here. The largest bell weighing three tons is Great Peter at Gloucester. It's not all about large bells. They also make small hand rung bells. Above is a photo taken in the workshop where the supports for the bells are made. The happiest place to work they told me. Once here we never want to leave. I'm keen to see the foundry itself, where the bells are cast using the same methods since medieval times. Only a few are permitted each year as it is a fully working foundry, not a museum. My name is down to hopefully be selected next year! Obviously a very relaxing place, too - can a wheelbarrow really be such a comfortable bed? Working as flat-out as that bloke is, who would want to leave? Hope your name comes up! so interesting and we just saw the liberty bell last summer! Looks like a relaxing place to work! What a great choice to show us. I hope you get to see the where the bells are cast! Love that guy taking a break in his wheelbarrow. London is synonomous with bells - oranges and lemons and all that. How fascinating. Hope you get to go and look soon - would be interested too. What an interesting place! I do hope you are chosen to look around the foundry! The name Whitechapel always reminds me of Jack The Ripper...I always find it sinister and avoided to visit the area. 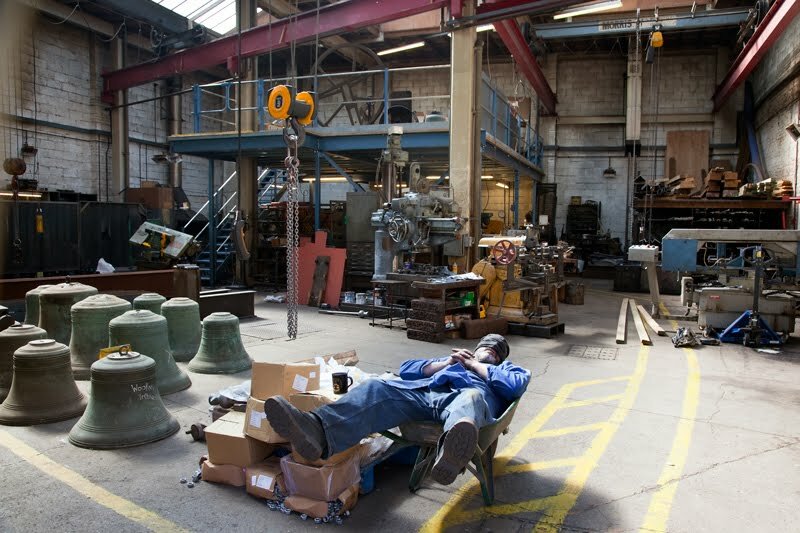 But this bell foundry looks very inteersting. Ciao. A. What a great place to choose for Whitechapel - bells are such a London icon.